On a Thursday evening, in March or April, around the year 30 A.D., Jesus had a very special supper with his disciples. It was already a special meal, being the annual celebration of the Jewish Passover. But Jesus made it even more special, by predicting at that meal his imminent death. While doing so, he said some unforgettable words as he was passing around the wine and the bread of the meal. Later that evening he was arrested and tried by the Jewish leaders. Early the next morning he was brought before the Roman governor Pilate who condemned him to death. Within a few hours, he was nailed to a cross for a slow and painful death. He was then buried. Saturday he was dead in the grave. Early Sunday morning, by a miracle of God, Jesus rose from the dead, and throughout that day and the weeks to come, made several appearances to many people. From the beginning of what we now call the Last Supper, until the Easter evening risen-from-the-dead appearance of Jesus to his disciples, it was not more than three days; probably less than 72 hours. And yet, our entire Christian faith depends on those hours. The littlest Sunday school children learn early in their lessons that Jesus loves them and died for them. Paul, that most brilliant theologian and preacher of the Christian faith, said that if Christ has not been raised from the dead then our faith is in vain. All the great words and stories of the Old Testament lead up to these three days; and all the history of the Christian church over the last two thousand years are in response to the events of those three days. Of all the great religious leaders of world history, only Jesus claimed to be God, and then validated that claim by coming back from the dead, thus defeating death and the grave. Present in this Holy Week story are all the great themes and truths of the Christian faith. Jesus taught much about prayer, and in the garden of Gethsemane and from the cross itself we see him praying the most intense and powerful prayers of his life. Jesus taught us to forgive, and from the cross we see him forgiving even those who had just pounded large spikes into his hands and feet. Throughout the Bible, we see even the greatest heroes of faith fail and fall into sin. In the passion story we see all of Jesus closest friends fail him; Judas, certainly by his betrayal; but also Peter by denying Jesus, and all the disciples by deserting Jesus. Yet after the resurrection, Jesus seeks them out to forgive them and give them a new beginning. Jesus saw not only many conversions, he also saw stubborn unbelief and rejection. That too is in the passion story. There is the insistence by the Jewish leaders on Jesus crucifixion, and by the mocking and jeering of the crowd at the foot of the cross. Every believer of every age has struggled at one time or another with God’s will, wondering why God doesn’t answer prayer or come through with the needed miracle. 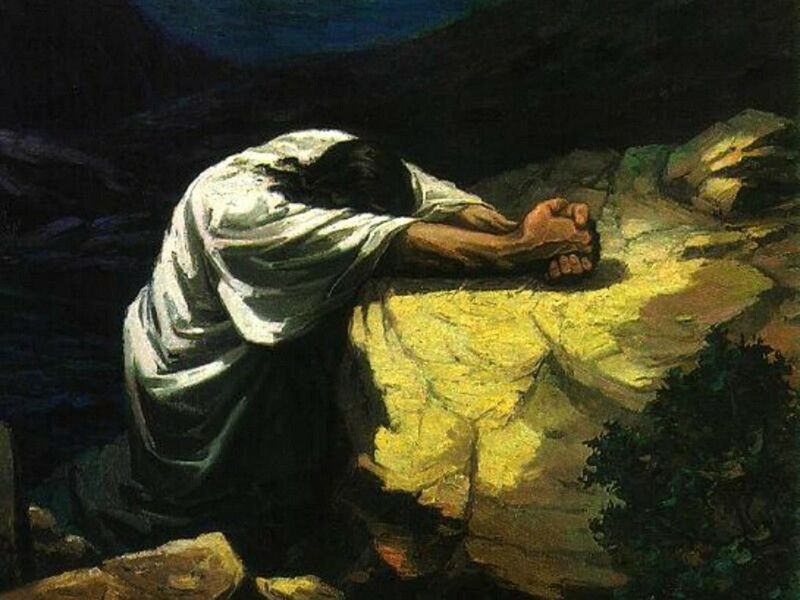 Jesus also faced this disappointment, praying in the Garden of Gethsemane that he not have to endure the suffering to come; but then adding, “Not my will, Oh Lord, but thine be done.” In this we are given a model for enduring life’s afflictions and disappointments. During the days of Jesus’ ministry he performed many great and wonderful miracles. When he was arrested Jesus performed a miracle, healing a man whose ear was cut off by Peter’s attempt to fight off the soldiers. Then, even in death, the miracles continued; the sky darkened, there was an earthquake, and the temple curtain was torn in two. In the Last Supper, Jesus began the Sacrament of Holy Communion by which we would remember him and in which we would receive the forgiveness of sins. On the cross, Jesus showed us how one can die with faith and courage and with a prayer of confidence to God, praying, “Into thy hands I commit my spirit.” Then on Easter morning came the central event of the Christian faith and all human history, when Christ rose from the dead proclaiming the word and promise that all who believed in him would also be raised to live with him and the Father in heaven forever. All of those truths from throughout the Gospels and the rest of the Bible, all are present in this central, all important passion story. One can learn almost all one needs to know for life and salvation from just this story. I Corinthians 15:1-4 — Now, brothers and sisters, I want to remind you of the gospel I preached to you, which you received and on which you have taken your stand. By this gospel you are saved, if you hold firmly to the word I preached to you. Otherwise, you have believed in vain. For what I received I passed on to you as of first importance: that Christ died for our sins according to the Scriptures, that he was buried, that he was raised on the third day according to the Scriptures.